As the rest of the comic lines in the Marvel Universe are gearing up for the AXIS event, Captain America is pulling double duty. Not only providing story clues to the upcoming problem that all heroes and villains will be facing, but also dealing with the events started way back in issue number 1. Rick Remender continues to push out solid writing on this title, even if it gets away from the reader from time to time. The series started with Cap being taken to the mysterious Dimension Z, and has bounced back and forth throughout the last 24 issues. The art is handled by a veritable tag team of artists, with Carlos Pacheco and Paul Renaud lending their pencils, Mariano Taibo and Paul Renaud (again) inking, and Dean White and Sonia Oback laying down the color. 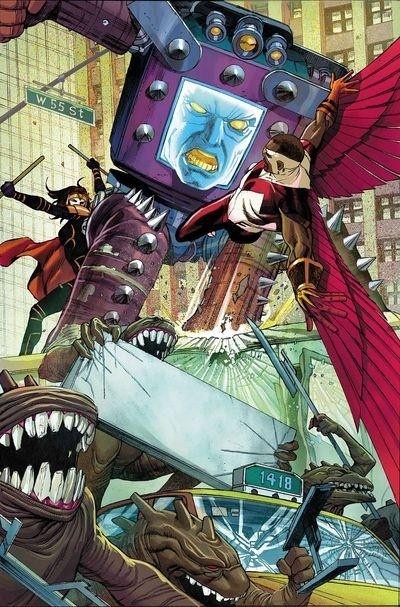 This book remains a highly stylized, artistic book, not just a run of the mill superhero comic. The flashes of Dimension Z and also the lab of Armin Zola are fantastical and awesome to look at. Pacheco and White also tackle the cover, which shows just how powerful Zola has become, and how much trouble Sam Wilson, a.k.a. The Falcon, is in. After the reveal of the last issue that (SPOLIERS) Sharon Carter is alive, the game has changed a little. Falcon and Zola’s daughter Jet are trying to stop Zola’s plans, and now are tasked with a rescue mission. Sharon is locked away in Zola’s tower, and now that Steve knows, he issues the plan to get her back from his command center. Remember, he has had the super soldier serum sucked out of him, and is now a withered old man with a cane. But don’t count him out, because he is still a brilliant tactician, and helps to command the troops consisting of Falcon and Jet, his adopted son Ian who has come back all grown up from Dimension Z, and also a smattering of Avengers like Iron Man, Spider-Man and Moon Knight. The tension builds to a climax as Ian is able to save Sharon, but discovers that Zola’s true plan is a bomb that can wipe out all of Manhattan, along with all the superheroes in the near vicinity. Great action follows, and The Falcon has to make a hard choice to save the day. But, not so much a choice, as he does the heroic thing without even thinking about it, like a true hero. The pages of Captain America have been crafting this story for quite some time, and it is all coming to a head with this issue and the penultimate next issue, number 25. 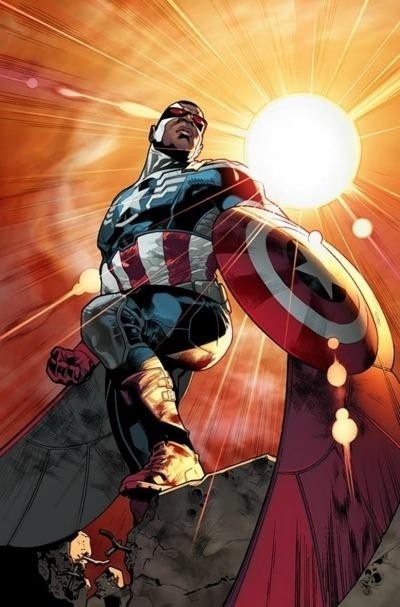 It was released that Falcon will be taking the mantle and shield of Captain America, and Remender does a great job getting him, and us the readers, up to that point. Also, the Dimension Z/Arnim Zola stuff is about to boil over, which will most likely have direct consequences on the AXIS event, seeing as the Red Skull has a lot do with it, as well as Remender writing that event. I’m only talking ‘bout Falcon-Cap — Shut yo mouth! To be honest, I was not a big fan of the direction of this series when it rebooted, yet again, to number 1. The Dimension Z storyline felt wrong and out of place to me. But now, after sticking with it for 24 issues, I’m glad I did because it really has given a bunch of cool moments, and a rich tapestry of a story to tell. Remender does great work across the board (see Uncanny Avengers and a personal favorite of mine, Black Science) so I shouldn’t have doubted his storytelling in the first place. The final page of this book is meant to be a cliffhanger, but alas, Marvel tipped their hand a little too soon. It depicts The Falcon flying off to what can only be seen as his certain death, to save the city and everyone in it. But we know that to be 100 percent false, because the news of him taking over for Captain America has been out for months now, and has even made national news circuits. The unfortunate downfall of trying to tell a good story in monthly segments, but also get people to want to come and buy the book way in advance. Maybe he dies and gets resurrected within the first two panels? CBH Score: 4 out 5 stars. Good story, fun action, just should have opted for a different cliffhanger ending.